Here's a story that has a beginning and an end, but no middle. The Wittelsbach Blue Diamond is a stunning cushion shaped 35.56 carat blue diamond with VS2 clarity, from the famed "Old Mines" of India. This historic diamond was acquired by King Philip IV of Spain in 1664 for the dowry of his daughter, the Infanta Margaret Teresa. After her death it became the property of her husband Leopold I of Austria and Holy Roman Emperor. When the Archduchess of Austria married Bavaria's Crown Prince in 1722, the diamond became known as "Der Blaue Wittelsbacher" (The Wittelsbach Blue) after the Crown Prince's family. It remained in the royal family until the last king abdicated in 1918. In 1931 the "Wittelsbach" is auctioned in a lot under the title of "Austrian Crown Jewels" by Christies, the auction house tries to sell it and although it was knocked down at £5,400 to a purchaser named 'Thorp', the general impression is that the diamond remains unsold. Here the mystery begins, the stone does not return to Austria, it disappears. Later evidence shows that it was sold in Belgium in 1951 and again three years later. 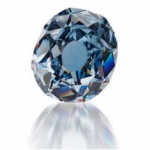 In January 1962 a fourth generation Belgian diamond dealer called Joseph Komkommer received a phone call asking him to look at an Old Mine cut diamond with a view to recutting it. He realised the historical significance of the stone and refused. What's more, he put together a consortium of dealers to purchase the stone. It was bought by a private collector in 1964 and until last week, the diamond was said to be in Bavaria. On Wednesday 10th December 2008, it went under the hammer at Christie's for the second time in its history. This time they were successful. The "Wittelsbach Blue" became the world's most expensive diamond ever sold, going for a record $24.3 million to a very happy Laurence Graff.